Aloe Vera's use can be traced back to 6.0 Century. It is known as the "plant of immortality” and is also a proven skin healer. AloeVera is said to improve collagen repair, hence it prevents wrinkles, is a powerful detoxifies, antiseptic and tonic for the skin. 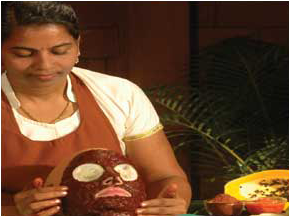 This is the traditional waxing process with a touch of Somatheeram’s signature balm for healing, nourishing and pampering the skin. Mehendi is very ancient and has gaineda lot of popularity over the years. It is also referred to as a temporary tattoo. Application of Mehendi on various body parts looks very attractive. It has a unique appeal and hence has emerged as a great fashion statement. Mehendi consists of at natural ingredients hence it is safe and hazard free, it is very safe as it doesn't cause any skin problems.